I'm hittin' the comic racks on May 30th! 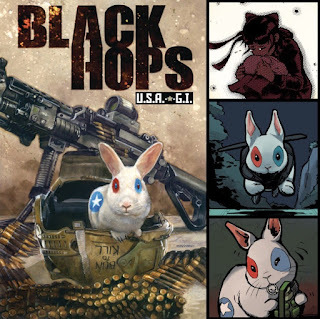 Black Hops: U.S.A.-G.I. is a two-issue miniseries coming from Mark Pellegrini (writer, me), Timothy Lim and Brian Denham (artists), and with covers by the legendary Dave Dorman! "North Korea has a nuclear warhead aimed at Hawaii, and every last American commando unit sent in to disarm it has gone missing. With the clock ticking, the fate of the Aloha State rests in the paws of U.S.A.-G.I. This dauntless, highly trained special missions leporid must now cross the 38th parallel and take on the Nork forces, both man and animal, to save the world from a nuclear war!" Here is the info in Previews and you can preorder it from your local comic shop. If you're into cute animals killin' dudes, you might want to check it out! Gonna have to update my Holds list next week! I want a stuffed animal of U.S.A.-G.I.! Ninja turtles.....ninja...military? Turtles...hamsters....no...bunnies? Hmm lets see where this takes me! Is President Thump in this? I have to add this to my list! Congrats! Congrats! I hope it sells really well. Thanks, everyone! If it does alright, Antarctic might have us come up with another 2-issue miniseries in the future; who knows! And, heh, non. Thump won't be appearing in USA-GI. Or Wall-Might. Tim and I decided to keep this one separate from our political parody books; make it more accessible. Is this delayed? I pre-ordered, but wasnt delivered this week.